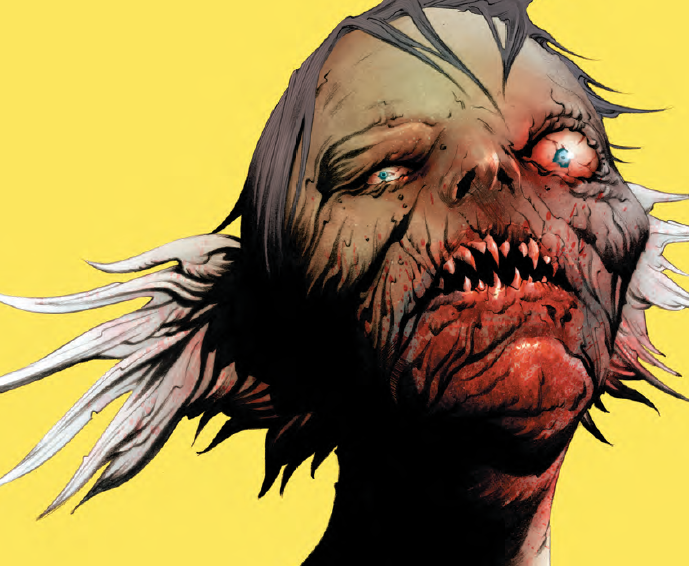 The Dreaming #6 Review – AiPT! When it comes to The Dreaming, things get real very fast. This world that has been abandoned by its creator is falling apart and those who live in it are having a real hard time keeping their minds and the literal fabric of the world together. The latest issue from DC Vertigo drops today and in it a major confrontation takes place, Dora learns something about herself, and a new god comes to town. Dora has been the main character in this narrative who has had the opportunity to pop out for a bit here and there. Throughout, her identity and purpose have been a major sticking point for her. Answers about her identity drop here so if you’re even a smidge interested in the character get ready for shocking reveals. An interesting method of dialogue. Simon Spurrier writes an issue that is captivating, interesting, and above all else inspiring. Using an interesting dialogue structure, the book opens with Dora speaking to herself. Panels drawn with the character are written in conventional bubbles and between those are in red brackets. This allows her to speak to her inner self in a way that is believable and compelling. As the story carries on, her self doubt eats away at her, but with the Dreaming potentially shattering into a million pieces Spurrier spurs her into action. This is an excellent DC Vertigo book that harkens back to the imprint’s glory days. It had me thinking, it took a while to read, and I reread bits of dialogue simply to revel in them a bit longer. Lines like, “Broken ain’t the same as worthless” matter greatly to the characters, but also the reader. I think we can all see a little of ourselves in Dora, further making this story an inspirational one. It is, of course, a fantasy story too with some big ideas thrown into the mix. Spurrier does not let off the gas pedal either, driving home a robust read that satisfies old questions and asks brand new ones. The way this issue ends the creators could take a six month hiatus and we’d all be in line to get the next one. It’s that good. Bilquis Evely is telling just as compelling of a story visually as Spurrier is laying out in the dialogue. Paired with Mat Lopes the art has a subdued nature that makes everything more real. Evely does not skimp on details, and mixed with Spurrier’s text-only panels seems to put even more effort into the panels surrounding them to keep the story flowing well. The full-page splash cliffhanger is frame-worthy and is yet another page from this series that has been awesome. Dora’s struggle is quite real and you feel her pain in her eyes, and the deep-rooted humanity in her fight in the end too. Dora goes through a lot of emotional and physical changes in this issue. It’s funny how different this issue flows in comparison to previous issues. That’s not so much a negative as an observation. There are no double page layouts, for instance, and the narrative focuses more exclusively on Dora than other characters. By comparison, it doesn’t quite feel like the same series although it serves as a wicked climax. The Dreaming is a visionary delight in comics storytelling. Issue #6 is not only proof of that, but it’s yet another example of it from a series that has been everything you’d expect from DC Vertigo. If this issue was the sirens song count me as one of those jumping overboard for more. The Dreaming is a visionary delight in comics storytelling. Issue #6 is not only proof of that, but it's yet another example of it from a series that has been everything you'd expect from DC Vertigo. If this issue was the sirens song count me as one of those jumping overboard for more.